AEWG general meetings are open to all interested individuals. This site (www.aewg.org) hosts latest information for the upcoming AEWG meeting. as well as contents and index information, searchable for word/term/author! Th 9th International Conference on Acoustic Emission (ICAE-9) & 61th Acoustic Emission Working Group Meeting (AEWG-61) will be held in Chicago. The meeting is open to all individuals interested in acoustic emission technology and applications. Journal of AE, Volume 36 Part 1 (2019) online here. Journal of AE, Volume 35 (2018) online here. On behalf of the organizing committee and international advisory board, I am pleased to welcome the global AE community to Chicago. As a native of the Chicago area, I am particularly glad to share “my city” with you. Chicago is located in at the southern end of Lake Michigan in the central USA and enjoys direct airline service from major airports worldwide. While it is a young city by world standards (incorporated 1837), Chicago has risen to prominence as a global transportation hub, financial and manufacturing center, and locus for education and innovation at the heart of a metropolitan area of over nine million people. The history of Chicago is intimately connected with technological and scientific innovations: reconstruction of the city following the Great Fire of 1871 included ten-story Home Insurance Building, the first tall building with a structural steel frame, and generally considered to be the world’s first skyscraper. In 1900, engineers reversed the flow of the Chicago River to protect water quality of Lake Michigan and enhance water transportation links through the region. The 110-story Sears Tower held the title of tallest building in the world from 1973 to 1998. While Chicago does experience some lively weather, the appellation “Windy City” refers to the enthusiasm with which early twentieth century Chicagoans promoted their city. At the time of the AE meeting in mid-June, we can expect warm, sunny days with the heat moderated by the cooling breeze from Lake Michigan. Most attractions within the city proper are accessible from the conference venue and suggested hotels by public transportation, taxi, or rideshare service – a rental car is not necessary. In the summertime, the single best way to see the city is by boat cruise on the Chicago River and Lake Michigan. A number of options are available, from water taxi service to narrated and catered cruises. The conference banquet will be held on one of the latter. In keeping with the city motto of Urbs in horto – “City in a Garden” – Chicago has many parks and public spaces, most notably a series of interconnected parks and paths along the Lake Michigan shoreline, and a ring of forest and prairie reserves around the city limits. Several national and state parks and reserves are located within a 1-2 hour drive from the city. In addition, nationwide domestic air connections are available from Chicago’s two airports (ORD and MDW), making Chicago a convenient hub for an extended visit to the USA. Talks describing AE applications in any field, as well as advances in AE fundamentals, sensing, and signal processing, are invited. In keeping with the working group character of the meeting, discussion of work in process is particularly welcome. As the 60th anniversary of AEWG is approaching, historical or retrospective talks on AE theory, technology, and personalities are particularly welcomed. Important: Please download this template for your manuscript. The language used in this event is English, so please write your paper in English. The author will be notified within one month after submission of the papers. Students are encouraged to submit a paper for Student Award Competition consideration. UI LABS is a tech organization driving the digital future of manufacturing and cities. We help companies solve problems far too big for them to solve on their own and connect them to innovators at universities and startups. By guiding our more than 300 partners through complex projects, we help them deliver cutting-edge solutions to their customers, improve their financial performance and transform industries. UI Labs offers a wide variety of programs, events, symposia, and thought-leadership lectures. Our industry, academic, nonprofit, and government partners have access to a variety of committee meetings, public workshops, roundtable discussions, and other activities in which they can network with each other, educate themselves, and establish fruitful new relationships. Save US $100 on general registration by registering by May 1. Registration includes 2.5 days of conference sessions, a social event on June 18, and the banquet on June 19. Fees are as follows: General registration: US $650 ($750 after April 15) Full-time students: US $300 Please register using this form hosted by the University of Illinois at Chicago, one of our conference host agencies. Please follow this link for further information (PDF, ca. 100KB). Please email an abstract for your paper in 100-300 words together with your paper. Author’s name, organization, address, phone number and email address. 51 years passed since the first meeting of Acoustic Emission Working Group (AEWG) was held in Idaho Falls, on February 8, 1968. AEWG had its beginning in a discussion between Allen T. Green (then at Aerojet-General Corp., now at Acoustic Technology Group) and Jack Spanner (then at Battelle Northwest). 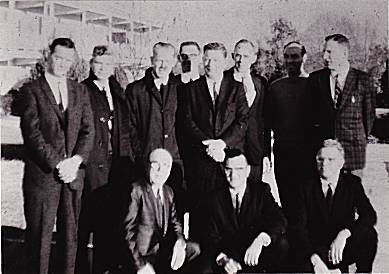 Spanner arranged for a formative meeting of interested parties to be held in Alcoa, TN, on November 2, 1967. The 12 people in attendance agreed to hold the first meeting in Idaho Falls in three months. At that time, eight others (T. Theodore Anderson, Thomas F. Drouilliard, Robert B. Engle. Robert G. Liptai, O.K. Mitchell, R. Neal Ord. Ronald E. Ringsmith and Richard K. Steele) joined to become the charter members of the AEWG. The photo is from the AEWG formative meeting; top, from left Robert Moss. Boeing Scientific Research Lab. (Seattle) -deceased; Dwight Parry, Phillips Petroleum (Idaho Falls); Norm K. Sowards, Same; Harold Dunegan -deceised, Lawrence Radillion Lab. (Livermore); Brad H. Schofield, Teledyne Materials Research. (Waltham); Phil H. Hutton. Battelle Northwest (Richland); Allen Green. Aerojet-General Corp. (Sacramento); Herb N. Pederson. Battelle-Northwest (Richland); bottom, from left; Charles Musser, Boeing Michaud (New Orleans) -deceased; Jack Spanner, Battelle-Northwest (Richland)· Julian Frederick. Univ. of Michigan (Ann Arbor) -deceased; Not in picture, Harvey Balderson. Boeing Commercial Aircraft; deceased. Baldemm took this picture. Also invited to the meeting, but not attended: C. Hartbower, Aerojet-General. W .R. Sturrock. Boeing. C. Tatto, Lawrence Radiation Lab.